Energise your office with some workplace fitness that will lift the spirits of your employees and increase productivity. 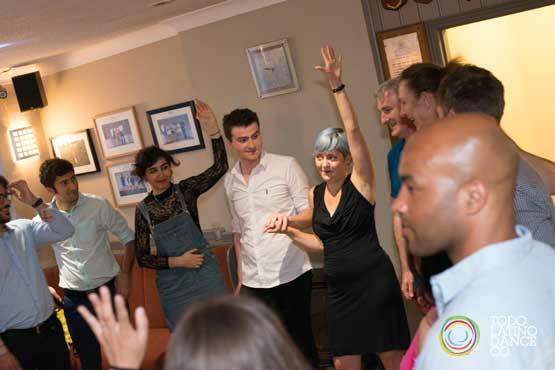 We can teach you a variety of different Latin dances during your training day, awards ceremony, dinner event, conference or even the office Christmas party, so whether your team is in need of a break or you’re celebrating the seasons, Todo Latino can be a perfect escape at great value for money. With performance backgrounds, the Todo Latino team has expertise in running productions smoothly and within budget, leaving your audience delighted and you relaxed. Renowned Bachata performer and teacher Amanda Hawley can put together a sensational pre-dinner dance show tailored to the size of your budget and venue. A successful way to encourage guests to mingle is by introducing a short Salsa lesson to the event. Our extensive contact base spans the best of professional dancers, teachers, DJs, equipment hire companies and many other resources. Todo Latino can offer specialist DJs for Latin, European and pop music for high-quality cultural entertainment. Thanks for such an amazing group lesson. It was truly fabulous and really made the party. All the best, I feel inspired to have lessons now. You made it easy to follow and fun! Thank you. Dance requires co-operation, collaboration and trust, many components to a strong team. We can work with you on a longer programme for your workplace to help your team be more dynamic together in the office. Why not try the Strictly Challenge? Incorporate Salsa into your day for some light-hearted competition and dance fitness that will keep your workers grinning ear to ear as they get back to work with a new lease of life. Even the most fascinating conference leaves people slumped in chairs through a lack of stimulation. If you’re losing your audience, you’re wasting your budget. Todo Latino’s energising sessions revive flagging attention to ensure you get a great return on your conference investment. There are many different options for how we can best work with you, so please don’t hesitate to get in touch so we can bounce ideas and come up with a tailored plan for your company together.